Cinnabar is an intriguing name. Sometimes I call it “Chinese Red”, especially if I am referring to furniture or antique wood items. 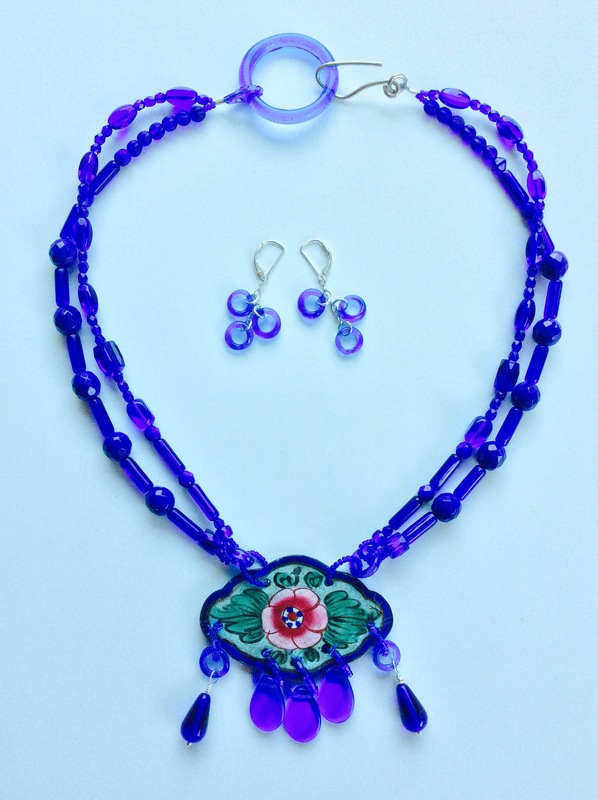 It is a terrific color for bead jewelry since it seems to flatter all skin tones. I buy cinnabar whenever I see it. 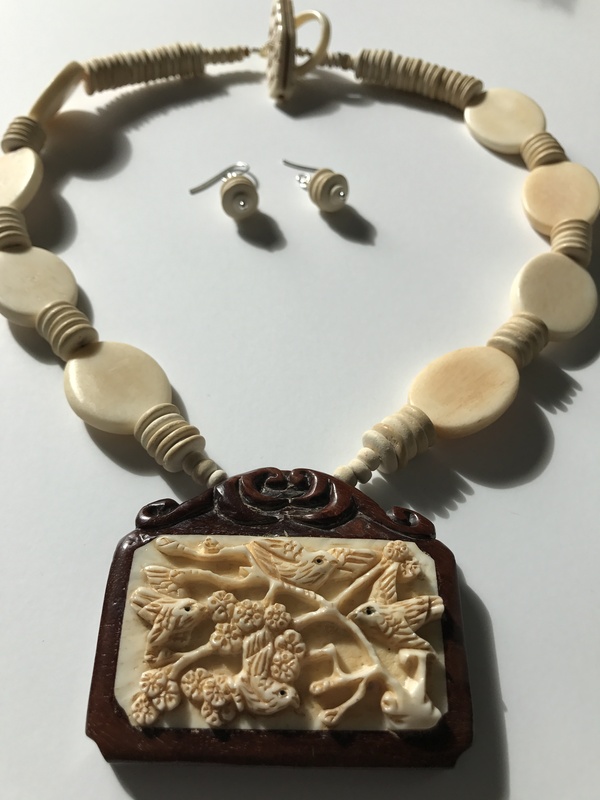 The more typical beads are carved, but my favorites are these large smooth and very light beads from Drawer 34. Cinnabar has been used in China since the Song Dynasty (960-1279 AD) when its name evolved from “red cinnamon”. Cinnabar is found in every mineral deposit that contains mercury. The Chinese avoided the toxic effects of mercury by coating it with lacquer, thereby creating their famous lacquerware. Today the toxic pigment is replaced with a resin-based polymer. All the famous Renaissance painters loved their scarlet pigment called vermillion made possible by mercury; today’s artists use the polymer version in their oils or acrylics. In this necklace, I separated the cinnabar beads with some Kris rings I found in Bali. Needless to say, they have an interesting history also: they are one of three components in the dagger found in Bali (also Thailand and a few other places); between the wood or silver hilt and the iconic wavy blade sits the Kris ring, historically red rubies, but glass and brass in my version. 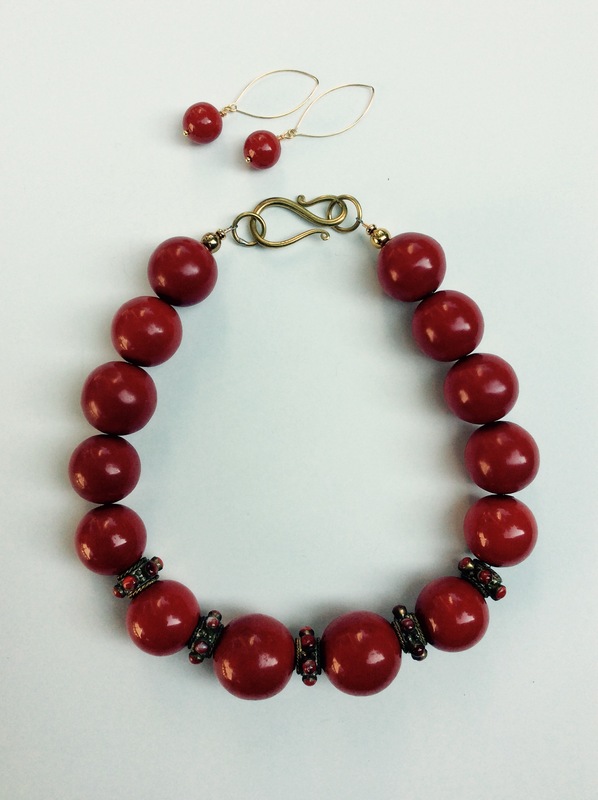 The oversize brass hook-and-eye clasp suits the large cinnabar beads which are 1” in diameter…but let me emphasize they are very light in weight. 20” long. Small cinnabar earrings included (or wear your own gold earrings). $95. 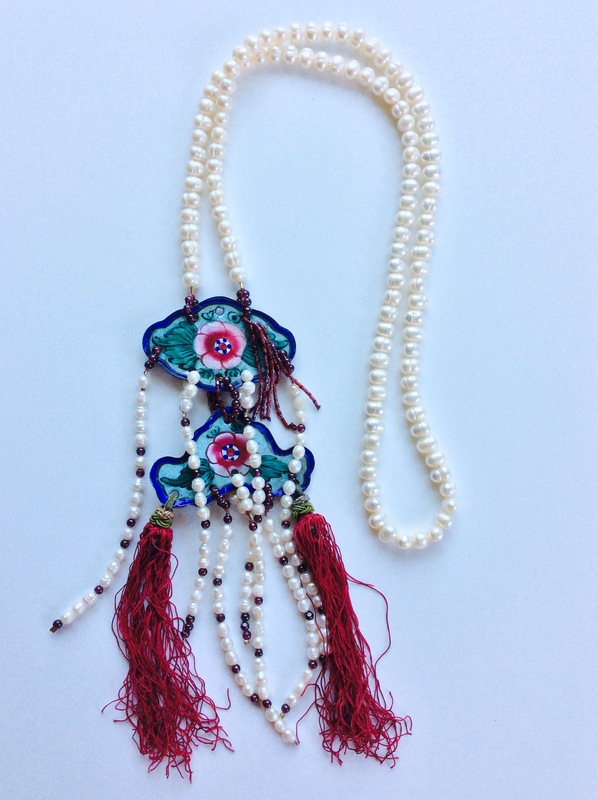 The two strand “Treasure” necklace is strung with heavy turquoise thread and “woven” through three turquoise beads every few inches. It ends with a coral clasp around a vintage button. It measures 21” and the centerpiece is 3” long. It is priced at $155 which includes shipping and insurance. 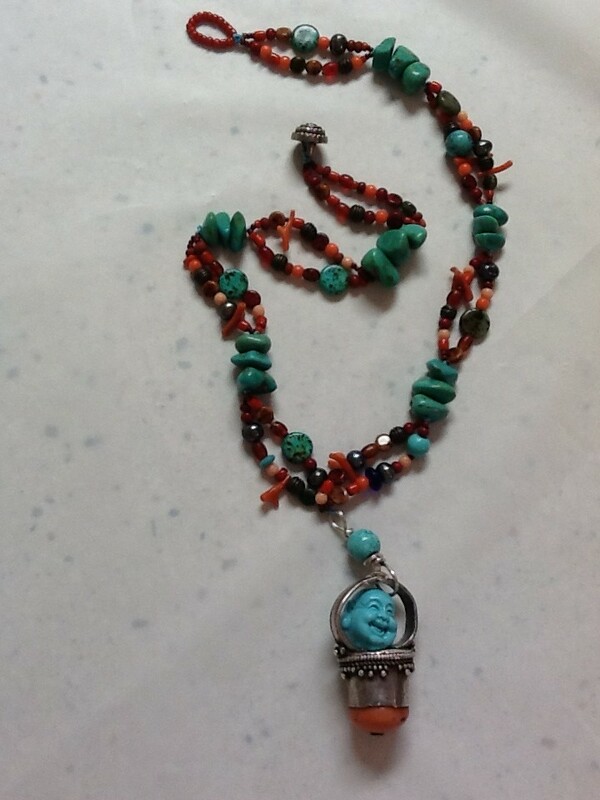 Back in 1995 when I was learning how to make necklaces, the second class I took was called “Treasure Necklace” and I remembered how much I love to make them when my friend Penny gave me a broken down necklace of turquoise, jasper and pearls. A treasure necklace is full of special things. 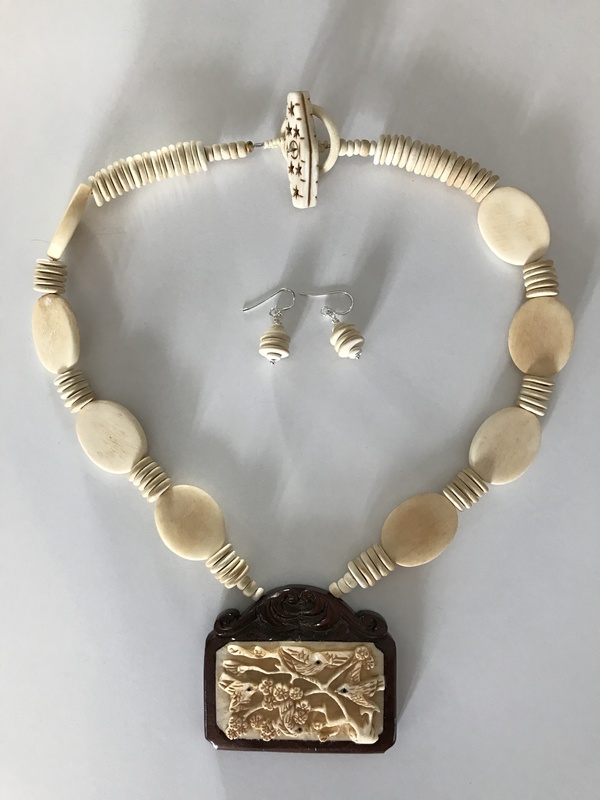 This necklace has Penny’s beads, supplanted by coral twigs, Czech glass reddish barrel beads, coral seed beads, a button clasp from my Mom’s button box…and those are minor compared to the centerpiece gems. The dangling centerpieces of a ring and a Buddha are amazing! The ring has a silver setting with decorative sterling silver balls around the base set with a coral bead, commonly traded among Tibetans. 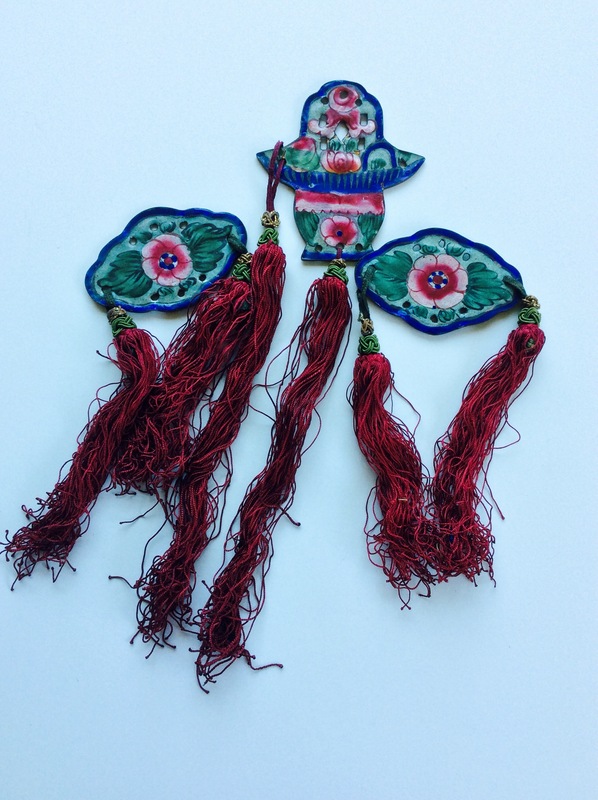 I bought it from a Tibetan woman in an informal market in front of the fabulous Jokhang Temple in Barkhor Square, Lhasa, the capital of Tibet. While we were bartering, pilgrims behind us circumnavigated the temple which is a holy destination for Tibetans. The ring is so large, it was obviously her husband’s whom I envisioned as a warrior of great girth. I bought it in 1993 since when it has been a much touched talisman; but I could never figure how to place it in a necklace…until now. To say it is a treasure underestimates it. Well, since I am a person compelled to fill spaces, I stumbled across the “Laughing Buddha” and didn’t he just fit in the ……space?! 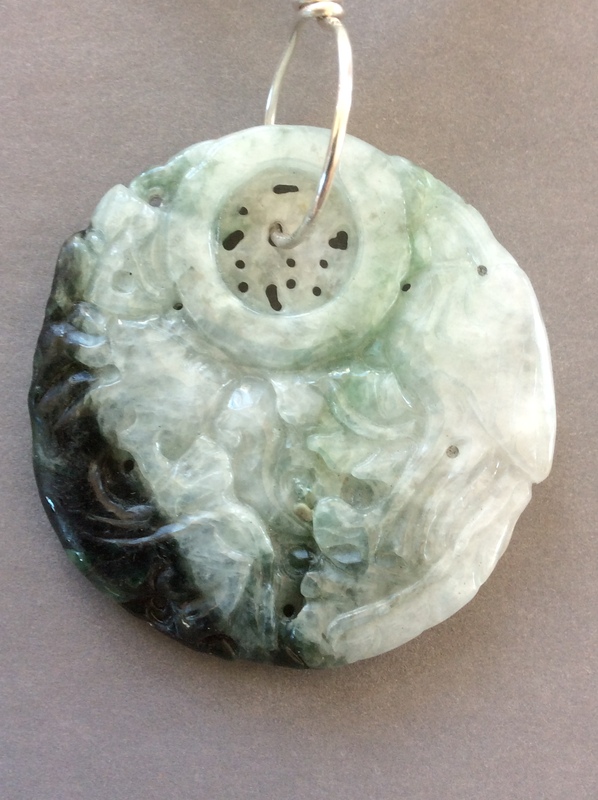 It is a contemporary bead, bought locally and made of resin. However this Buddha has a long history: in the Song Dynasty, China, in 1000 AD, the Laughing Buddha, symbol of naïve geniality, became the most popular god in Eastern Asia. 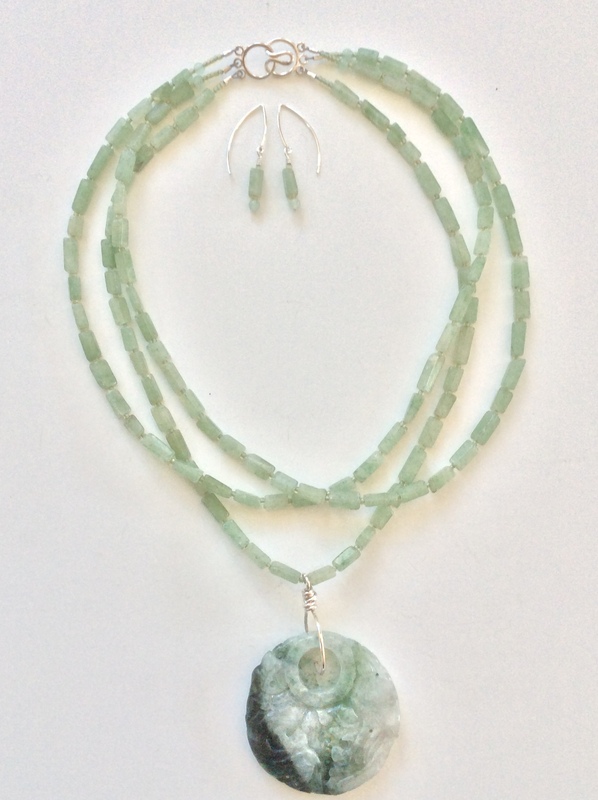 The two strand necklace is strung with heavy turquoise thread and “woven” through three of Penny’s turquoise beads every few inches. It ends with a coral clasp around a vintage button.